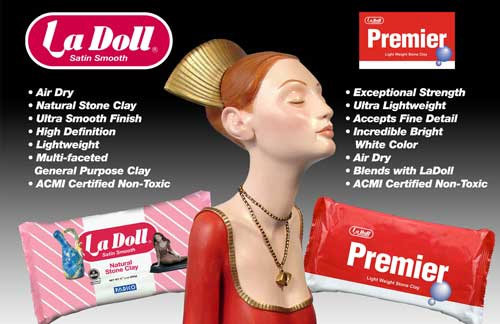 * Mold, sculpt, stamp, or carve; LaDoll is the perfect air dry clay for any fine detail work. * LaDoll contains highly refined pumice, talc, small amounts of paper pulp, and additional binders. * Adheres to any core material (Wire Mesh, Rigid Wrap, Paper, Glass, Plastic, Wood, and Styrofoam). * Extremely pliant allowing for exceptional detail. * Can be worked indefinitely by keeping the clay moist. * Air dries with minimal shrinkage. * Accepts acrylic, oil, and water based paints or dry finishing powders. * Can be carved, drilled, or sanded when dry. * LaDoll has the unique ability to be dissolved in water and used as a finish coat or soaked with paper and cloth to be formed into shapes. * LaDoll is world renowned as the clay of choice by one of a kind doll artist.